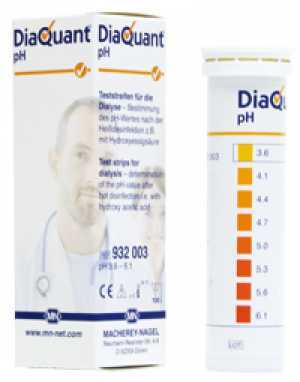 กระดาษทดสอบ pH (DiaQuant® pH CE* test strip) | Higher Enterprises Co.,Ltd. This test strip is designed to check the pH value of rinse water after hot disinfection with hydroxy acetic acid containing disinfectants (for example Diasteril). The test strip allows the quick and easy determination whether disinfectant residues are present. The easy Dip & Read procedure provides dependable results in 5 seconds. Hemodialysis equipment is often cleaned cleaned using Hydroxy-acetic-acid containing reagents, that need to be washed out prior to the next use. With this test, technicians can easily check if the system is sufficiently rinsed.